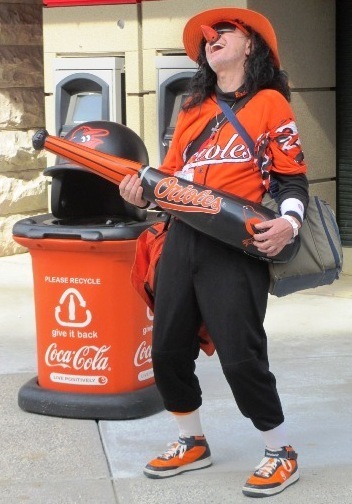 Still the best Orioles manager ever. On June 23, 1979, at the age of 11, I experienced what is still today my most memorable night at a ballpark. It was a time when teams still held two games in a day for the price of one on occasion, and a time when the Orioles drew just over a million fans in good seasons—about 15,000 a game. That day, or more correctly that afternoon and night, the Orioles were taking on the Tigers in a twi-nighter. My father had a connection at Memorial Stadium, who often would have great seats for us, but this night we weren’t so lucky, and we ended up in the upper level seats in left field. But it turned out to be a great spot to watch the flight of Eddie Murray’s walk-off home run ball in the first game, to the earthshaking delight of the crowd of 45,814 – a record for a Baltimore night doubleheader at the time. I still remember that announcement on the scoreboard, and enough beer splashing on me after Murray’s swing that I thought it started raining. The Orioles had been down 6-2 in that first game and won 8-6. In the second game, the O’s would again overcome a 5-3 deficit with two runs in the seventh and one in the eighth to win 6-5. You can imagine the impression two dramatic come-from-behind wins made on an 11-year-old. My first game at the Vet in Philly was a great one, but it didn’t top this. The 1979 Orioles especially were known for dramatic comeback wins, with a disproportionately large number of their 102 wins coming in the 8th inning or later. “Orioles Magic”, it was called, and it was attributed to both a dedicated fan base and the mood lift caused by “Thank God I’m A Country Boy” being played during the 7th-inning stretch at Memorial Stadium. With all due respect to O’s fans and John Denver, the Orioles late-inning heroics were probably more attributable to the amazing tactician in the dugout. Earl Weaver certainly had the best overall talent in baseball from 1969-1971, when the Orioles went to three straight World Series with Brooks and Frank Robinson, Boog Powell, Paul Blair and the pitching tandem of Jim Palmer, Dave McNally and Mike Cuellar. The team won over 100 games in each of those seasons, winning 217 in 1969 and 1970. But name some of the players in the later 1970s and early 1980s teams that were always in the thick of a pennant race in the toughest division in baseball. There was Jim Palmer and Eddie Murray, and…who? Longtime O’s fans remember the likes of Dempsey, MacGregor, Flanagan, Bumbry and Dauer, and possibly the best outfield platoon in history of Lowenstein and Roenicke, but if you weren’t an O’s fan, you likely wouldn’t know all their first names. I have a friend who understood me enough to get me tickets for a game at Camden Yards for my birthday in 1996. In the second row. As what I now consider great fortune would have it, that was the day the Orioles were celebrating Earl Weaver’s induction into the Hall of Fame. Part of the ceremony was Earl being driven around the field in a convertible sitting on the back of the car. So Earl Weaver passed right by me, just a few feet away. I cheered extra enthusiastically as he went by, and he smiled and shook his fist a little for me. What I didn’t know at the time was that the car was driven by Marty Springstead, another umpire with whom Earl frequently feuded. Presumably his appearance would suggest that their spats were behind them, but Springstead later said he was tempted to slam on the brakes and send Weaver flying. No, umpires did not like Weaver. It was one of the funnier themes that ran through Luciano’s hilarious books. Luciano not only shared his own classic stories about Weaver, like ejecting Weaver in both ends of a doubleheader in the minors, but several other umpires’ stories as well. With baseball’s new replay system, the current generation of fans may never appreciate what an entertaining part of the game arguing with umpires could be. Weaver was one of the best. And he had a reason for his fury with umpires. He was fully aware that his own ejection would not hurt the team. He could manage from the runway. But if Eddie Murray or Frank Robinson got ejected over a bad call, it would hurt the team. Luciano even admitted that Earl had his own way of making an umpire forget his problems with an Oriole player. His players—like Hall of Famer Jim Palmer, who wrote the hilarious book “Together We Were Eleven Foot Nine” about his often stormy relationship with Weaver—were also well aware of Weaver’s almost psychotic dedication to winning. Once he pulled Rick Dempsey from a game after a fundamental mistake, and then hounded him all the way into the shower screaming at him, until Dempsey turned on the water—and then turned on the cold water until a soaked Earl finally left. And there was Don Stanhouse, a pitcher O’s fans my age remember well, whose style was unheard of even to this day: he would simply walk guys until he got to someone he could get out. It worked. And you can imagine how Earl would handle it. One time he walked the bases loaded with the Orioles ahead in the ninth; Earl screamed at pitching coach Ray Miller to “get out there and tell him to throw strikes!” Miller went out to the mound to a grinning Stanhouse and told him his fly was open. Stanhouse told him to tell Earl not to worry. On the next pitch the batter grounded into a double play to end the game. Stanhouse’s nickname was “Fullpack”, as in the number of cigarettes Earl would smoke when he was on the mound. Yes, in the dugout, he was. For all of the legendary bouts with umpires and the fiery berating of players, Earl Weaver was unquestionably one of the best managers in the history of the game. I remember reading baseball publications when he managed, and in his era it was rarely disputed that he was the best in the game…an era of Billy Martin, Sparky Anderson, Whitey Herzog and Tommy Lasorda. My favorite story of Weaver’s skill came from Elrod Hendricks. It’s in the book “From 33rd Street to Camden Yards”, an excellent collection of quotes from key figures in Orioles history. It was Weaver vs. Tony LaRussa, when LaRussa was a new manager. 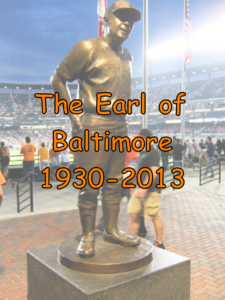 I share this Earl Weaver tribute because the Orioles were part of my life, and they are so because Orioles games at Memorial Stadium are my fondest memory of childhood. And they were fond memories because the Orioles won, often in an unforgettably thrilling way. And that, very often, was because of Earl Weaver. So although the closest I ever got to meeting him was cheering him while he rode by me in a car, I still feel today the impact Earl Weaver had, on millions, and on me as an Orioles fan who reaped in excitement the reward of his excellence. You will be missed, Earl, but you will be fondly remembered. Can You Bring Food Into Camden Yards?